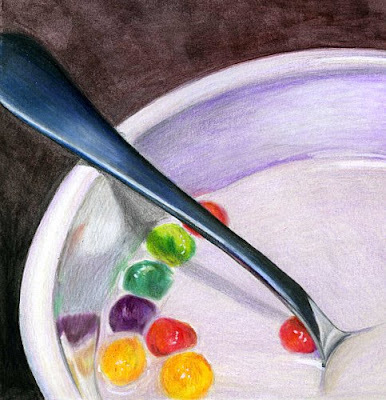 My favorite food as a kid had to be cereal. What else tasted so good and had a small toy in the box (if you got to it before your siblings did)? This is a mixed media piece. It is color pencils blended with mineral spirits, ink and acrylic paint and measures 6x6. Click here to join me on FaceBook.